Being a first-time parent is not a piece of cake. There are numerous things you need to pay attention to, from proper care to your baby’s needs, which requires a lot of effort and self-restraint. However, once you experience the wonder of being a parent, everything else will become less important to you. 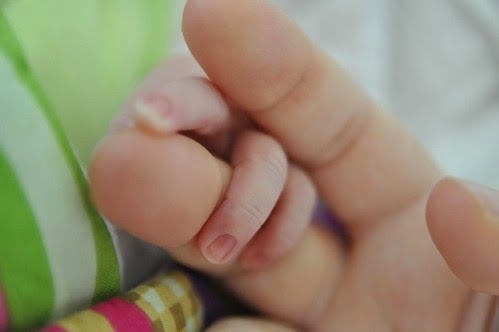 There is one thing you should keep in mind all the time, from the very moment your baby comes to this world. Having a baby is not just about panicking about numerous things. It is much more than that. As a parent, you are supposed to do everything in order to make your baby’s first years unforgettable. It is the period when your baby develops its senses, intelligence and creativity and you’re the one who should encourage their development. Here are some great ideas how to achieve that and have fun at the same time. As a new parent, you are probably afraid about everything new that happens to your baby. Well, that is the greatest mistake of every parent. If you want to solve every unpredicted situation successfully, you need to be completely calm and stay focused. For example, if your baby cries, it doesn’t mean that something is wrong with it. Crying represents a basic means every baby’s communication. However, if you notice something strange about your baby’s behavior, you should immediately call your pediatrician. Spitting up and vomiting are not the same thing! Spitting up is completely normal and it occurs especially after you have fed your baby. On the contrary, vomiting is something that happens more frequently and in larger amounts. If your baby is vomiting, you should contact your doctor since it may have caught some virus. If you baby is sleeping longer than it is supposed to, it doesn’t mean that it is ill. For example, if you took it for a long walk, it might be simply intoxicated by fresh air. Thus, letting it sleep longer is much better solution than waking it up. Also, don’t wake your baby in order to breastfeed it. When it feels ready to eat, it will definitely signal you that by waking up and crying. Waking your baby up might cause numerous irregularities in its metabolism. As they develop, babies start recognizing things and events around them. So, you need pay attention to your behavior. Fighting in front of babies may cause numerous negative results, both in physical and mental terms. There are numerous activities for you and your baby to try out. Your baby develops all the time, so you must provide it with various brain-stimulating and creative games. One of the most important things is wearing your baby. For the first few months, you should buy a ring sling or a strap-on front carrier that will make this process easier. They are great for walking your baby inside your home or going for a walk somewhere. When your baby turns fourteen months or so, you should adapt to its needs. For instance, when you go for a walk with it, you need to go at its pace. Kids are fascinated by everything and at this age, they will explore as much as they can. Therefore, you need to slow down and not to hurry them. These small explorations are great brain stimulants. Even when they are a month old, babies start reacting to sounds. Therefore, you need to sing to them a lot. At first, you should produce noises similar to those your baby produces. Repeating the same sounds your baby makes, you will encourage it to produce them even more. Another great idea is to choose some interesting melody and then turn them into DADADA or CHACHACHA voices. Use of different tones, sounds and volumes will help your baby start recognizing the differences between them. 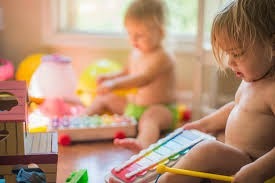 As your baby grows up, you could also use various simple instruments in order to make your singing more interesting. Babies simply adore different sounds! Apart from auditory abilities, visual exercises are the basic ones. Making your baby pay attention to details, to recognize colors, figures and various shapes can be extremely interesting. While your baby is just several weeks old, you should show your face to it as much as you can. Later, start using different objects. It is amazing how fast babies start recognizing shapes and colors. Also, you could put together puzzle or take a white paper and draw simple figures on it, making contrasts. Such exercises will strengthen your baby’s vision and develop its concentration. There are numerous ways for you to develop your baby’s creativity. One of the most interesting ones is letting it color. However, before you hand a crayon to your baby, you need to provide an appropriate example to it. It is fascinating how interesting coloring might be for babies. Another great idea is to play with your baby a lot. Choose dolls or stuffed toys and invent entire stories, which will influence your baby’s creativity. Finally, when you baby is about a year old, you can also read to it. Books with a lot of pictures have always been a great means of entertaining a kid. Apart from being sparkling clean, nursery needs to be well organized. Walls need to be painted in bright colors in order to make the entire room brighter. Also, the room needs to have enough windows, which will provide it with fresh air and lighting. Apart from choosing adequate furniture, you need to pay attention to details. For instance, your baby’s first steps and explorations will begin while it is playing on your floor. That is why you need to buy some nice rugs online. That will provide your kid with cozy insulation from cold floor and protect it from getting a cold. These are just some of numerous possible ideas for you to enjoy with your baby. Remember, treating it perfectly from the very beginning will leave some basic effects on its future behavior. ternyata banyak hal yang memang harus kita perhatikan untuk bayi kita ya mbak, dari yang terkecil sampe yang paling utama.